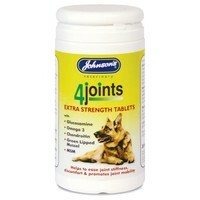 Johnson’s 4Joints Extra Strength Tablets for Cats and Dogs are easily digestible tablets, specially designed to ease the discomfort of stiffness within the joints, associated with age. The combination of natural ingredients is essential in the maintenance of health joints. When taken regularly, these tablets promote the growth of cartilage cells helping with joint lubrication. Now old age doesn’t have to be uncomfortable for your pet! My two older 11 year old cats have been taking these tablets for months now and they havent had a stiff joint since they began taking these. before taking these they would stiffen up and struggle with walking every once in a while.